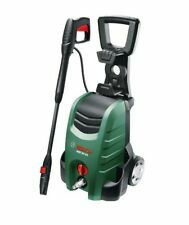 The Bosch AQT 37-13 pressure washer is powerful and efficient, ideal for cleaning bikes, cars, patios, driveways, garden furniture and guttering. The AQT 37-13 includes a 3-in-1 nozzle suitable for a wide range of cleaning tasks and a detergent nozzle for easy detergent application, ideal for cleaning cars and garden furniture. 90Â° nozzle. Nozzles: 3-in-1 nozzle. Nozzles: 90° nozzle. Auto-stop function ensures energy efficiency. This will help speed up the whole process. Toolstop will arrange the uplift of the goods. pressure: 130 bar. With its 3-in-1 nozzle with pencil jet, the UniversalAquatak 130 is the ideal solution for a range of outdoor cleaning tasks. Its quick and easy push fit connections allow you to start work quickly, as no extensive assembly is required and the compact tool is ready to use out of the box. Auto-stop function ensures energy efficiency. pressure: 130 bar. Bosch high-pressure gun. Cordless Power Tools. Corded Power Tools. Power Tool Accessories. inlet temperature: 40 °C. Power Tools. Power: 1700W. Product Contents: Gun, Lance, 450ml HP foam nozzle, 3-in-1 nozzle ( Fan, Roto & Pencil), 5m hose and Water filter. 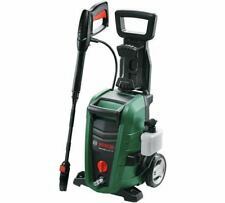 Product Range Bosch Universal Aquatak Pressure Washer Series. Pressure: 130 Bar. Bosch AQT 37-13 - Hidrolimpiadora. 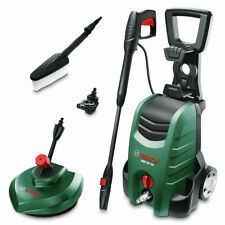 Bosch high-pressure cleaning gun. Max pressure: 130 bar. Temperature of entry: 40 ° C. It provides the exact power you need to carry out the tasks of. Motor power: 1.700 W.
Pressure – 130 bar Max. With its 3-in-1 nozzle with pencil jet, the UniversalAquatak 130 is the ideal solution for a range of outdoor cleaning tasks. Its quick and easy push fit connections allow you to start work quickly, as no extensive assembly is required and the compact tool is ready to use out of the box.